Nowadays the views across the Solway, whilst expansive and magnificent, take in only a few passing boats or ships. It is easy to think that the waters of the Solway have always been quiet, and without much traffic. The Solway however has a rich maritime trade history and boat building past. Maryport in Cumbria and Annan in Scotland both having been important ship building sites producing wonderful sailing ships and grand steamers which travelled the globe. 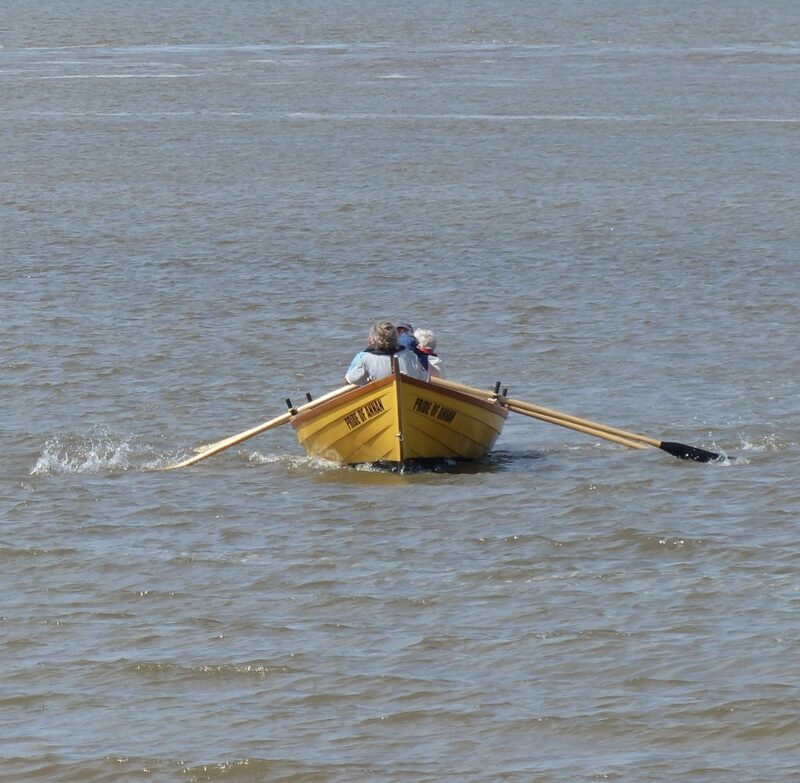 Another type of craft which would frequently have been seen on the Solway estuary and coastline were small rowing boats, which today are known as St Ayles skiffs, designed to transport both goods and people. Whilst there are a number of forgotten walking routes or ‘waths’ that for centuries have been used to cross the Solway on foot. These routes were known to be a dangerous option having over the years taken many lives when the speed of the incoming tide or the line of the route across the sands was misjudged. Similarly travel on land around the Solway coast during the turbulent centuries suffered in the UK Borderlands was a perilous activity. A skiff would for many people have been the transport mode of choice for travelling along the coast or across the estuary – far safer than travelling on land. Travel by skiff would not however have been without it’s perils, with the tidal drag of the estuary constantly changing the lines of the deepest channels, moving sand banks, creating new shallows, eddies and flows. Add to this mix the sometimes unpredictable and stormy nature of the coastal weather and it’s clear that knowledge and skill have always been essential for safe travel by rowing boat on the Solway waters. A story that illustrates the dangers of crossing the Solway in a skiff is that of a love smitten couple – John Edgar and Jean Scott – who in 1771 decided to elope to Gretna Green to get married. The marriage laws in Scotland being different at that time to those of England. To avoid angry parents who wanted to prevent the wedding, the young people chose to hire a skiff and crew to row them the short distance from Burgh by Sands marsh in Cumbria, England across the waters to Gretna Green where they could be married legally under Scottish law. Their parents found out about the plans, pursued the couple and also hired a Solway skiff and oarsmen to take chase across the estuary. A Solway storm was brewing, whipping up waves. The eloping couple, drawing on the skill of their crew whilst still pursued, fought their way through the waves and arrived safely in Gretna Green where they were married. Unbeknown to them the boat pursuing them capsized in the storm. This resulted in the drowning of one of the oarsmen. It is not known if the young married couple ever returned to England or if they heard about the tragic incident associated with their elopement. Occasionally these days it is still possible to see traditionally built skiffs being rowed along the Solway coastline. In late summer you might get a sighting of skiffs rowed by teams of four with a cox steering the boat, making their way out into the middle of the estuary on a crossing from Annan harbour in Scotland to Bowness on Solway in Cumbria, England – all taking part in an event that marks a locally notorious theft of the Bowness and Dornock Church bells in 1626. This year there is also an additional and splendid opportunity to see some coastal skiff rowing races in July at the Skiffie Worlds 2019 – a rowing event which is taking place in Stranraer in Dumfries and Galloway in Scotland. 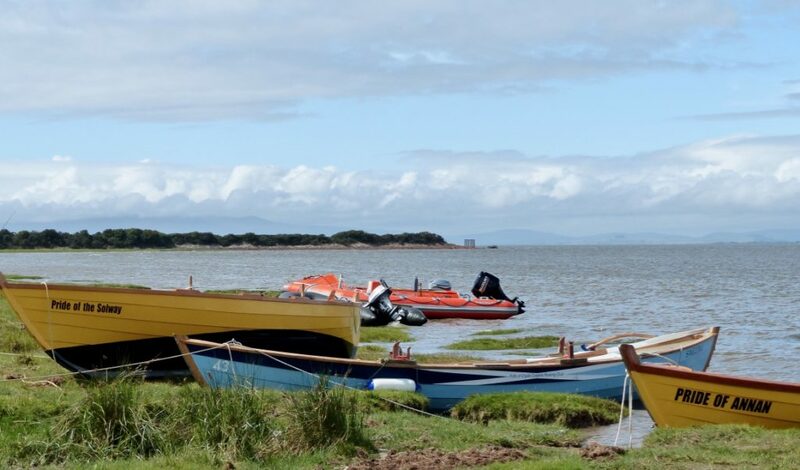 Up to a 1000 competitors from all over the world are expected to take part…… a fine celebration of the coastal skiff, a very traditional form of Solway transport.